This Professional Permanent Tattoo Kit Includes: 1) Instructional Tattoo Book (Tattooing A to Z), 2) Instructional Tattoo video (The Art of Tattooing VHS), 3) Wayne Dry Heat Sterilizer S-500, 4) Black & Silver Power Unit 1 with clipcord and footswitch, 5) Supreme Quick Change with s/s 3 needle round tip liner tube, 6) Supreme Quick Change with s/s 6 needle square tip shader tube, 7) 2 oz. Bottle of VooDoo Brand black liner ink 10 1/2 oz. Bottles of VooDoo Brand dispersion colors #1, 8) Pad VooDoo Brand tracing paper, 9) 8 oz. Spray bottle, 10) 2 Hectograph pencils, 11) Roll surgical tape, 12) 5x Eye loupe, 13) Package of 5,3 needle liner bars, 14) Pkg. of 5, 6 needle flat shader bars, 15) #9 Ink cap holder, 16) Package of 100 #9 ink caps, 17) Disposable razor, 18) Box of latex gloves, 19) 5 Non-adhesive bandages, 20) 5 Foil packs of Bacitracin, 21) 1 Pint bottle of green soap, 22) 5 Alcohol prep pads, 23) Classic Speed Stick, 24) 1.5 qt. Sharps medical waste collector, 25) Box of 250 Dry Heat Sterilization Bags, 26) 32 oz. bottle of Wavicide, 27) Sterile skin scribe, 28) 5 Color design sheets with line drawings from the Don Nolan collection (NC) (our choice), 29) Ink It! Tattooing Practice Skin, 30) Tattoo Artist T-Shirt, 31) Tattoo machine key fob, 32) Certificate of Excellence, 33) Window sticker, 34) 10 Complimentary black & white design sheets, no line drawings (our choice). NOTE: S&H FOR THIS KIT IS $75.00 NOTE: Click Thumbnail Image or Here to view larger Photo of Professional Kit. 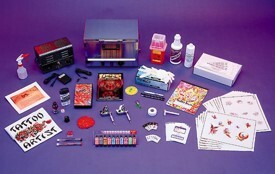 This Professional Permanent Tattoo Kit Includes: 1) Book, Tattooing A to Z, 2) Instructional video, The Art of Tattooing (VHS), 3) Power Unit II with footswitch, 4) Revolution II machine with a 3 needle square tip tube, 5) Revolution II machine with a 6 needle square tip shader tube, 6) Pkg. of 5, Revolution 3 needle liner bars, 7) Pkg. of 5, Revolution 6 needle flat shader bars, 8) 1.5 qt. Sharps medical waste collector, 9) Pad VooDoo Brand tracing paper, 10) Classic Speed Stick, 11) Sterile skin scribe, 12) 8 oz. Spray Bottle, 13) 2 Hectograph Pencils, 14) Roll surgical tape, 15) 5x eye loupe, 16) 10 Disposable #9 ink cap holders, 17) Pkg. of 100 #9 ink caps, 18) Disposable razor, 19) Box of latex gloves, 20) 5 Non-adhesive bandages, 21) 5 Foil packs of Bacitracin, 22) 32 oz. bottle of Wavicide, 23) 1 Pint bottle of green soap, 24) 5 Alcohol prep pads, 25) 2 oz. Bottle of VooDoo Brand black liner ink, 26) 10 1/2 oz. Bottles of VooDoo Brand dispersion colors, 27) 5 Color design sheets with line drawings from the Don Nolan collection (NC) (our choice), 28) Ink It! Tattooing Practice Skin, 29) Window sticker, 30) Tattoo machine key fob, 31) Spaulding & Rogers Certificate of Excellence, 32) 10 Complimentary black & white design sheets, no line drawings (our choice). 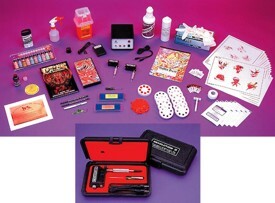 NOTE: S&H FOR THIS KIT IS $55.00 NOTE: Click Thumbnail Image or Here to view larger Photo of Professional Kit.